Eva Goldgruber, Susanne Sackl-Sharif, Robert Gutounig & Julian Ausserhofer (2017). Social Media as a crisis communication arena: Digging into new communication spaces. In: Proceedings of the 4th European Conference on Social Media (ECSM) (ed. A. Skarzauskiene / N. Gudeliene). Academic Conferences and Publishing International Limited, pp. 115-123. Susanne Sackl-Sharif (2015). 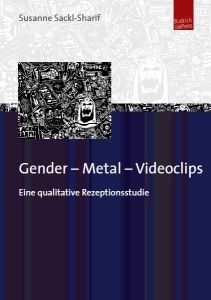 Gender – Metal – Videoclips. Eine qualitative Rezeptionsstudie. Opladen/Berlin/Toronto: Budrich UniPress Ltd.